Our Slovakian Alps: High Tatras self guided walking holiday lets you explore Slovakia’s highest mountain range, which is also the first Slovak national park. 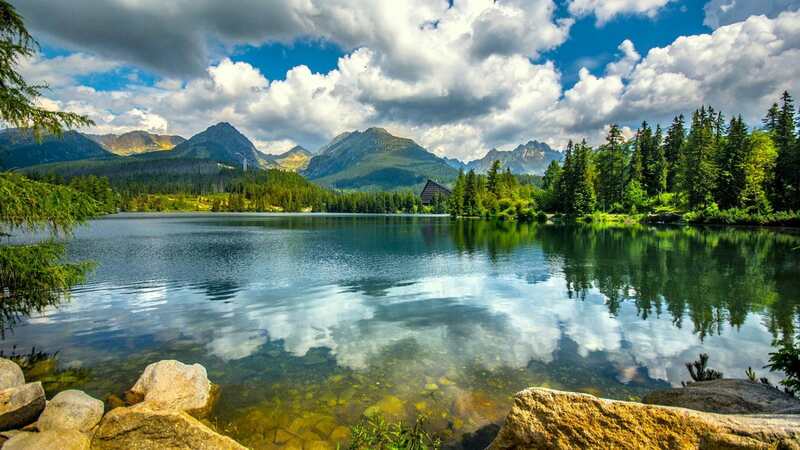 There are about 35 valleys, 110 glacial lakes called pleso, and many mountain peaks, ten of which are above 2,600 meters high. The trip to Lomnicky Peak provides a breath-taking view of the Tatra mountains and Slovakia. Along with its Polish part, the High Tatras constitute a UNESCO Biosphere Reserve since 1993. On your routes, you may encounter chamois, the symbol of the High Tatras. It is one of the most precious species, as it developed in isolation since the glacial age which is why it differs from its relatives living in the Alps or Apennines. Its protection is rigorous because only 1,000 animals survive at present. The High Tatras are the only mountain range in Europe which has four main predators still living in its area, namely bear, eagle, wolf and lynx. Accommodation is in 4 and 3-star hotels. Two of the hotels were built at the beginning of the 20th century and have unique architectural features. Although they have been modernised to the highest standards, you can still admire their Golden Age beauty and atmosphere. The last two nights are spent in a 3-star hotel near Strbske pleso lake, one of the most famous and visited lakes in the High Tatras. Optional: “In Style” upgrade: if you prefer to stay on last two nights at the luxury 4-star Hotel Solisko on the lake shore, you can choose this option when completing the online booking form. Arrive at Poprad airport and meet with our representative at the airport. Car transfer to Tatranska Lomnica village. Poprad is considered to be the primary entrance gate to the High Tatras. Next to interesting historical sites and famous medieval Spisska Sobota town, the modern and eco-friendly tourist resort Aquacity Poprad is a big attraction. Tatranska Lomnica is a mountain hiking resort best known for the cable car to Lomnicky stit (peak) and the highest and steepest piste starting at an elevation of 2,190 m.
Your walking today starts by taking the cable car to Skalnate pleso. It is situated in Skalnata dolina (Rocky Valley) under southern slopes of the Lomnicky stit (peak). On rocky terrain, you will follow the trail to Velka Svistovka peak (2,037 m). There you will reach the highest point of the trail, and after that, you will descend on the rocky path. Reach the Hut by Zelene pleso lake. In the hut, you can have a rest and enjoy lunch. After resting, you will continue through a forested rocky path to Biela Voda’s bus stop. Cable car to Skalnate pleso lake (1,755 m). Walk until you reach a mountain hut called Zamka. After a break in Zamka hut (1,460 m), you will continue to Hrebienok passing by The Cold Creek Waterfalls. Walk to Hrebienok, a ski centre located above Stary Smokovec village, on the southern slope of the Slavkovsky Peak. Taking a cog railway, you will reach Stary Smokovec village where you will spend next two overnights in a 4-star hotel. Additional option: This day is short and not very demanding. If you feel good and the weather is fine, you can take a 4 km route from Zamka hut to Teryho hut (2,015 m). For this extra walk, you will need additional 3 hours. Cog railway to Hrebienok (1,275 m). Following marked routes, you will reach Zbojnicka hut (1,960 m). The hut is situated in the upper part of the Velka Studena Dolina (the Great Cold Valley), below the Zbojnicky crest. The name “Zbojnicka” means “robber”, which is a part of the owner’s family history when poachers used the hut. The way back is via the same route. On Hrebienok by cog railway back to the hotel. Following a marked trail, you will reach Sliezsky Dom hotel (1,670 m) where you will spend one night. The hotel is situated in Velicka Valley and is the primary starting point for climbing the Gerlachovsky stit (2,655 m), which is the highest peak of the High Tatras and Slovakia. Additional option: you can shorten up the route to Sliezsky Dom by taking a cog railway to Hrebienok. From there it is about 6 km to Sliezsky Dom (2 hrs, 560 m elevation gain) and you can save energy for hiking Vychodna Vysoka peak and back. The peak (2,428 m) offers a perfect view, situated in the line of the main ridge of the Tatras mountains. Three valleys surround the summit: the Velicka Valley, the Velka Studena Dolina (the Great Cold Valley) and the Bielovodska Dolina (The White-waters valley) above the area called the Frozen Basin of the Svistova Valley. Following the red-marked route, you will reach a beautiful glacial lake called Popradske pleso (1,520 m). Once you reach the lake, you can have a rest in another mountain hotel – Popradske Pleso or at Majlathova hut. Both have restaurants. The place is a starting point for hiking to Rysy peak and Koprovsky peak. Continue walking, and you will reach the goal of this day – Strbske Pleso lake (1,352 m). Last two nights are at a hand-picked 3-star hotel in the village. Your last hiking day in the High Tatras is quite demanding in length (15 km) and elevation gain (950 m). On the positive side, you will see the 30 m high waterfall Skok in Mlynicka valley which is one of the most beautiful waterfalls in the High Tatras. From Waterfall Skok, you will continue to Bystra Lavka (2,314 m) and from there walk to Pod Furkotou, where you will join the route leading back to Strbske pleso lake. Accommodation is provided in two 4* and two 3* hotels. The 4* hotels have been servicing guests for over 100 years. The 3* Sliezsky Dom hotel is the highest situated hotel in Slovakia. All hotels provide comfortable accommodation in well designed double/twin en-suite rooms. There are wellness centres in all hotels. Hotel Grand Praha has an outdoor pool with thermal water. Optional: “In Style” upgrade: if you prefer to stay on last two nights at the luxury 4-star Hotel Solisko on the lake shore, rather than 3-star Hotel Fis in the village, you can choose this option when completing the online booking form. Breakfast is included. Half board option is possible to order. Each hotel has its own restaurant where you can taste international or Slovak meals or you can also try Slovak cuisine in local restaurants called Salash or Koliba. Each hiking day passes by several mountain huts with restaurant facilities where you can get water and lunch. We recommend you to try the lentil or goulash soup. From the soft drinks, we recommend kofola which is similar to Coca-Cola and is a traditional drink. You should also try traditional local spirits called Horec or Tatra Tea. These are the typical spirits for the High Tatras and are made of herbs. Be careful – they are quite strong! On the trails, you can meet men with huge loads on their backs who supply huts with goods. It is another attraction in the High Tatras. You can check Bratislava or Krakow airports too, with more frequent flights from different UK airports operated mostly by Ryanair. Transfers from Poprad Tatry airport to the hotel and back are included. The driver will wait for you at the arrival hall holding up a board with your name. Pick up time from the hotel on departure day will be specified on the spot. You will be provided with the contact info of the driver. Cable cars and cog railway on walking days are included. You will get a GoPass card which serves as a ticket for all rides included according to the itinerary. Local transports are excluded. Baggage transfer is included on all walking days and will be arranged by your current hotel to your next hotel. After check out, you will leave baggage at the hotel reception and you can start hiking. When you arrive at your next hotel, your baggage will be at the hotel reception. Language: Slovak. In hotels and huts, staff speaks English. Most of the young people are used to foreign travellers and speak English. 3 courses menu: 12-20 EUR. Up-to-date travel advice on Slovakia is available here. Moderate level suitable for fit hikers. On some days it is possible to modify the itinerary for less experienced hikers. The terrain is mostly rocky and can become slippery in rain or fog. This tour is not appropriate for beginners and casual walkers but for fit hikers that are used to walk in high altitudes and do longer distances. Average walking distance is 11.5 km with total elevation gain exceeding 3,000 m, and average daily elevation gain is 515 m (read more about difficulty grades). Tour can be organised between June 15 and October 31. The itinerary contains routes which are closed to the public during winter and spring due to protection of nature. Best months for hiking in the High Tatras are September and October. The flexibility of self-guided holidays means that there are no fixed dates and you can start your holiday on any date in the season – so please indicate desired starting date when booking. Climate is mostly of a mountain and alpine character, cold and moist influenced by high altitudes. Snow cover in valleys and peaks persists from 180 to 250 days of a year. Windy weather is typical and during summer afternoon storms are usual. Average year temperature in 1000 m above sea level is 5°C, in July is 15 °C. Main luggage is limited to airline policy only. On walking days your main luggage is transported to the next accommodation. For your daily essentials, you should bring a comfortable rucksack. Bringing good hiking shoes and waterproof jacket is essential. In May and October, light gloves can also be useful. Below is a non-exclusive list of what you should bring to this trip. More detailed info will be included in your holiday information pack. If you need further advice, please contact us or a reputable outdoor retailer. Optional: “In Style” upgrade – if you prefer to stay on last 2 nights at the luxury 4-star Hotel Solisko on the lake shore, rather than 3-star Hotel Fis in the village, you can choose this option when completing the online booking form. Spend one extra night during your holiday and climb Gerlach, the highest peak of the High Tatras. One extra night at Solisko Hotel on the shore of Strbske Pleso lake. Treat yourself after the holiday with one day of relaxation in this beautiful hotel. I had a memorable holiday in Slovakia. The weather was excellent. All the hotels were comfortable and of high standard and the staff were helpful and friendly. The mountain guide I met on my first night was most informative. He explained all the trails and what conditions to expect in great detail. The transfers for my luggage were efficient. My case was waiting for me when I arrived at each hotel. I enjoyed every hike I did. All the trails are well marked and with the app and map were easy to follow. It's hard to pick a memorable moment as there were so many, but the night sky at Sliezsky Dom was amazing. I've never seen so many stars. Any advice I would give to anyone wanting to explore this area is, go at this time, early October. According to the locals I spoke to it is less crowded and the weather is better. We had a wonderful walking holiday in Slovakia, finishing with one night in Krakow. The most memorable moment for me was reaching the high elevation point above Popradske Pleso which was absolutely beautiful. [...] We didn’t make much use of the app although a couple ladies in our group used it more than others. [...] The routes were so well marked, we didn’t feel the app was that necessary in Slovakia. The transfers were first class, lovely big bus, accommodating all of us and our luggage no problem at all. Good roads the whole way there, not winding along a mountain side which one of our party was worried about, due to travel sickness. The three Slovakian hotels were all excellent, we all particularly loved Sliezsky Dom where we were able to book into and have the spa all to ourselves for an hour. The breakfast at all the hotels was very good and the travel guide who helped us on our arrival was very useful. [...] We had a brilliant holiday and would recommend visiting Slovakia and the Natural Adventure Company to anyone. Thanks your for your professional approach and excellent organisation. It was a wonderful holiday which I would recommend to friends. The most memorable part would be some of the scenery in Slovakia, particularly up high around the lake. [...] Thank you for all the work you put in organising our trip. Most memorable was the guided climb of Gerlach Peak. The guide was very professional and patient as we hadn’t seriously climbed for a couple of decades. We were lucky with weather on the day - it was perfect. The views were stupendous. Otherwise the walk up to Zboynicka Chalat in the rain was superb, the garlic soup at the Chalat was memorable and we saw a chamoix on the way down. Used the facilities in the hotels, they all came with saunas, plunge pools, massages and relaxation rooms. The maps provided by the NAC were very good as was the Tour Book and Smartphone App. The paths are very clearly marked so getting lost would be pretty hard to do!! Booking process was fine. I found the App quite useful once I got my head around it, but prefer hard copy maps when out on the trail. Trails were fantastic, very well marked, challenging in places, scenery & views superb. The plan of varied lengths between days was a good idea, as was the use of cable cars and rail as it got us up to the pointy end quickly and cut down on a lot of what would have been repetitive walking. The Chalets were great, food prices very reasonable and the food very, very good. Accommodations were a surprise, could not fault any of them. The staff were exceptionally polite, professional and helpful. The facilities are great - spas, saunas, massages, relaxation rooms. Our rooms were very good, clean and more than enough space. The hotels, apart from Slievksy Dom (late 20th century), were early 20th Century, once very grand, but a little care worn - but that made them particularly charming. The food was very good, again a surprise, I was not expecting it to be that good - varied, fresh, well made, good pricing, and plenty of choice. We had the best time,[...] would go back to the High Tatras again in a heart beat and your organisation of the trip was excellent - we did not have one problem. The mountain scenery that we did get to see was spectacular. The hotels were good - I especially liked the Grand Hotel Taranska Lomnica with its gracious dining room and the hot pool with a marvellous view. Roman, who briefed us on our first evening, was very helpful.